First published in London in 1836 as the South Australian Gazette and Colonial Register, first Adelaide edition in 1837. Front-page classifieds with news and photographs and fantastic sketched advertisements inside. Although South Australia’s first newspaper, it’s reputation as a conservative newspaper enabled The Advertiser to gain superiority in the first half of the century. 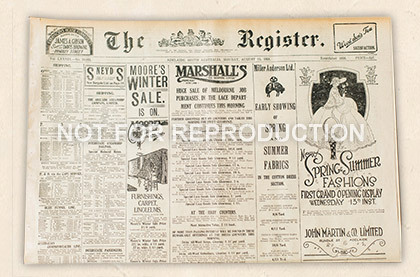 Despite several format changes, The Register was eventually acquired by The Advertiser in the early years of the Great Depression.